Differentiation of cellular lineages is facilitated by asymmetric segregation of fate determinants between dividing cells. In budding yeast, various aging factors segregate to the aging (mother)-lineage, with poorly understood consequences. In this study, we show that yeast mother cells form a protein aggregate during early replicative aging that is maintained as a single, asymmetrically inherited deposit over the remaining lifespan. Surprisingly, deposit formation was not associated with stress or general decline in proteostasis. 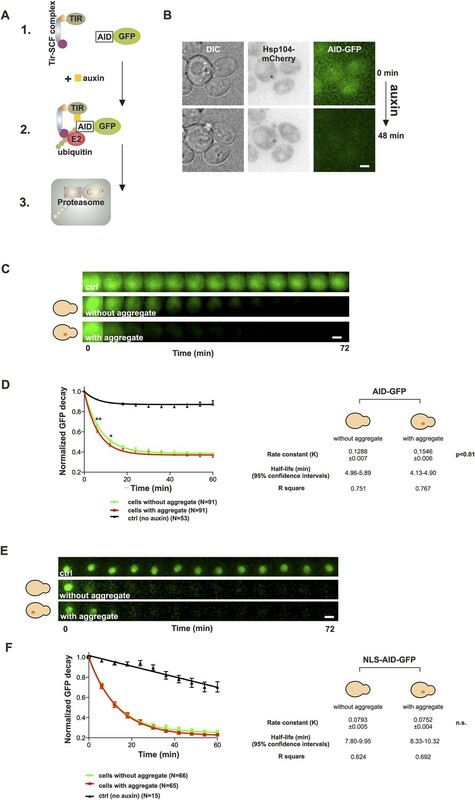 Rather, the deposit-containing cells displayed enhanced degradation of cytosolic proteasome substrates and unimpaired clearance of stress-induced protein aggregates. Deposit formation was dependent on Hsp42, which collected non-random client proteins of the Hsp104/Hsp70-refolding machinery, including the prion Sup35. Importantly, loss of Hsp42 resulted in symmetric inheritance of its constituents and prolonged the lifespan of the mother cell. Together, these data suggest that protein aggregation is an early aging-associated differentiation event in yeast, having a two-faceted role in organismal fitness. Aging is a complex process. Studies involving a single-celled organism called budding yeast are commonly used to investigate the factors that contribute to aging. When these yeast cells divide, a small daughter cell buds out from a large mother cell. A mother cell has a limited lifespan and produces a finite number of daughter cells and then dies (a phenomenon referred to ‘replicative aging’). However, when a daughter cell forms, the daughter's age is reset to zero, giving it the full potential to produce new offspring. Previous research on budding yeast has shown that damaged or aggregated proteins accumulate in the mother cells but not the daughter cells, and that this accumulation of proteins contributes to shortening the lifespan of the mother cell. Furthermore, protein aggregation has also been associated with a number of age-related diseases in humans, including neurodegenerative disorders such as Alzheimer's and Parkinson's disease. However, it remains unclear how cells respond to protein aggregation that occurs during aging. Many studies that have previously investigated this question have relied on exposing cells to stressful conditions, such as high temperatures, in order to trigger proteins to aggregate. But now, Saarikangas and Barral have studied how proteins aggregate under normal, unstressed conditions in budding yeast as they age. The experiments revealed that most unstressed yeast cells develop a single deposit of aggregated proteins already during early aging. This age-associated structure proved to be a different type of response than the protein aggregation that occurs during stress. Furthermore, the deposit did not form as a consequence of the cell having obvious problems with folding its proteins, nor did the deposit hinder cells from coping with stressful conditions that trigger protein misfolding. Rather, this deposit supported the ability of the cell to degrade defective proteins. This suggests that the deposit represents an early adaptive response to aging, which might consequently provide aged cells some advantage over their younger counterparts. Saarikangas and Barral also found that this protein deposit was always retained in the mother cell and not passed onto the daughters at cell division. Further experiments showed that an enzyme called heat shock protein 42 was responsible for collecting target proteins and bring them together to form the single deposit. Reducing the levels of this enzyme prevented the deposit from forming and extended the lifespan of the mother cells. Thus, these findings suggest that mother cells collect harmful protein aggregates into a single deposit and prevent them from entering the daughter cells. Further work is needed to understand how the deposit is preferentially retained within the mother cell. Aging results in an increasing decline of the organism's fitness over time (Lopez-Otin et al., 2013). Remarkably, this process segregates asymmetrically during budding yeast division: the mother cell forms an aging lineage, whereas the daughters generated by these mothers rejuvenate to form eternal lineages, similar to the segregation of soma and germ lineages in metazoans. Such lineage separation requires that the inheritance of factors that promote aging, such as defective/deleterious organelles, proteins, and DNA, is asymmetric during cell division (Sinclair and Guarente, 1997; Aguilaniu et al., 2003; Erjavec et al., 2007; Henderson and Gottschling, 2008; Shcheprova et al., 2008; Liu et al., 2010; Zhou et al., 2011; Hughes and Gottschling, 2012; Higuchi et al., 2013; Clay et al., 2014; Denoth Lippuner et al., 2014; Henderson et al., 2014; Higuchi-Sanabria et al., 2014; Thayer et al., 2014; Katajisto et al., 2015). Therefore, how cells are able to recognize, sort, and coordinate the asymmetric segregation of aging factors and other fate determinants is an outstanding question in biology (Neumuller and Knoblich, 2009). Protein aggregates and/or damaged proteins are a hallmark in the etiology of many human disorders associated with aging (Hartl et al., 2011; Wolff et al., 2014), and their presence correlates with aging of mitotically active yeast and drosophila stem cells (Aguilaniu et al., 2003; Erjavec et al., 2007; Bufalino et al., 2013; Coelho et al., 2013). Studies on budding yeast have shown a correlation between the accumulation of protein aggregates and replicative aging by demonstrating that Hsp104-mediated protein disaggregation is required for full replicative life span (Erjavec et al., 2007), and that over-expression of Mca1, which counteracts the formation of stress- and age-associated protein aggregates (Lee et al., 2010; Hill et al., 2014), extends the life span of yeast mother cells (Hill et al., 2014). How cells respond to protein aggregation that occurs specifically during aging has remained elusive since most studies investigating the cellular responses to protein aggregation have relied on over-expression of non-native, aggregation prone proteins, proteostasis inhibitors, or other stressors, such as heat (Kaganovich et al., 2008; Liu et al., 2010; Specht et al., 2011; Zhou et al., 2011; Malinovska et al., 2012; Spokoini et al., 2012; Winkler et al., 2012; Escusa-Toret et al., 2013; Zhou et al., 2014). These studies have uncovered specific modes of cytosolic compartmentalization that take place when cells encounter proteotoxic stress. For example, cells stressed with heat respond by forming multiple protein aggregates (referred to as peripheral aggregates, stress foci, Q-bodies, or CytoQ) at the surface of the ER (Specht et al., 2011; Spokoini et al., 2012; Escusa-Toret et al., 2013; Miller et al., 2015; Zhou et al., 2014; Wallace et al., 2015). These structures, hereafter referred as Q-bodies, contain acutely misfolded proteins that are sorted between the nuclear and cytoplasmic degradation/deposit sites by the Hook family proteins Btn2 and Cur1 (Malinovska et al., 2012), and coalesce together by the aid of small heat shock proteins; Hsp42 in budding yeast (Specht et al., 2011; Escusa-Toret et al., 2013), and Hsp16 in fission yeast (Coelho et al., 2014). Simultaneously, Q-bodies are being rapidly resolved by the protein disaggregase Hsp104 (Parsell et al., 1994; Specht et al., 2011; Zhou et al., 2011; Spokoini et al., 2012; Escusa-Toret et al., 2013), together with other heat shock responsive chaperones such as Hsp70 and Hsp82 (Escusa-Toret et al., 2013). The formation of Q-bodies seems to aid stress survival, as the deletion of HSP42 resulted in defective tolerance of prolonged heat stress (Escusa-Toret et al., 2013). The asymmetric inheritance of Q-bodies by the mother cells is promoted by the geometry of the bud neck (Zhou et al., 2011), tethering to mitochondria (Zhou et al., 2014), and by actin cable-mediated retrograde transport, which is dependent of Hsp104 and Sir2 (Liu et al., 2010; Song et al., 2014). Notably, Sir2 is also a key player in processes that underlie the asymmetric segregation of damaged mitochondria (Higuchi et al., 2013) and the accumulation of extrachromosomal DNA circles (Sinclair and Guarente, 1997; Kaeberlein et al., 1999) to the aging mother cell. Prolonged Q-body-inducing stress (heat or over-expression of thermolabile proteins) combined with proteasome inhibition can lead to the formation of a dynamically exchanging deposit of ubiquitylated proteins named the juxtanuclear quality compartment, JUNQ (Kaganovich et al., 2008; Escusa-Toret et al., 2013). This structure is regulated by the Upb3 deubiqutinase (Oling et al., 2014), by proteosomal activity (Andersson et al., 2013) and by lipid droplets (Moldavski et al., 2015), and it was also shown to appear during replicative aging (Oling et al., 2014). The faithful inheritance of this structure by the mother cell is dependent on its association with the nucleus (Spokoini et al., 2012). More recently, it was shown that the ‘JUNQ’ might actually reside inside the nucleus, and it was thus renamed as intranuclear quality control compartment, INQ (Miller et al., 2015). The JUNQ/INQ assembly is dependent on Btn2-aggregase (Miller et al., 2015), a protein also found to be involved in prion curing (Kryndushkin et al., 2008, 2012). Apart from the JUNQ/INQ structure, terminally aggregating proteins, such as the amyloidogenic prions Rnq1 and Ure2, were shown to partition to an non-dynamic, vacuole-associated deposit called the insoluble protein deposit IPOD (Kaganovich et al., 2008; Tyedmers et al., 2010b), which has remained less well characterized. Despite this wealth of data, it remains unclear how these exogenous/stress-induced aggregation models relate to protein aggregation that takes place during physiological ‘healthy’ aging. Particularly, it is unclear why/how protein aggregates arise during aging, how are they segregated during cell division and, importantly, what is their consequence to the protein quality control of the aging cell, as well as to the aging process itself. To illuminate these aspects, we probed the role of protein aggregation during unperturbed replicative aging. Our findings indicate that protein aggregation is a prevalent and highly coordinated event of early aging and is not solely associated with proteostasis deterioration. Instead, we provide evidence that age-associated protein aggregation may initially benefit the cytosolic protein quality control, but eventually becomes involved with age-associated loss of fitness. To address the role of protein aggregation in unperturbed, physiological aging, we analyzed microscopically the replicative age-associated protein aggregation landscape in budding yeast by visualizing different chaperone proteins that mark aberrantly folded and aggregated proteins. 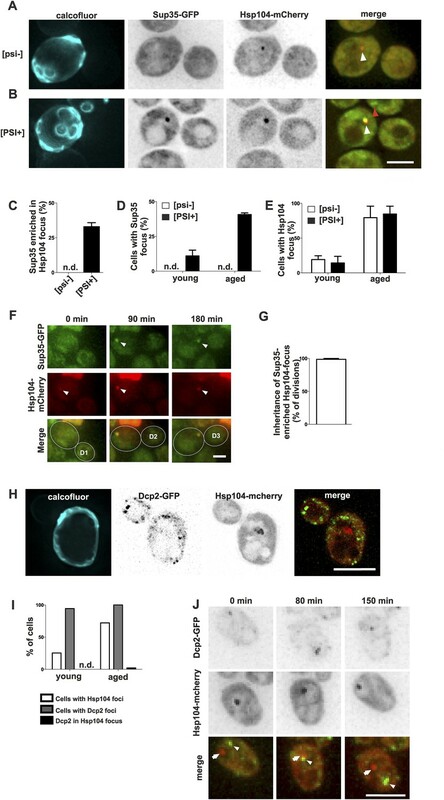 By employing the Mother Enrichment Program (MEP) (Lindstrom and Gottschling, 2009) (Figure 1—figure supplement 1A), we harvested cells of different age and first analyzed the localization of endogenous GFP-tagged protein-disaggregase Hsp104 (Parsell et al., 1994; Glover and Lindquist, 1998), a broad sensor for protein aggregates (Figure 1A, Haslberger et al., 2010). Interestingly, we found many cells displaying an aggregate (typically a single bright Hsp104-labeled focus) and this portion increased in a progressive, age-dependent manner such that >80% of cells that had undergone more than 6 divisions displayed such a structure (Figure 1A,B), as previously reported (Aguilaniu et al., 2003; Erjavec et al., 2007). Co-localization analysis with Hsp104 demonstrated that the Hsp70 proteins Ssa1 and Ssa2, the small heat shock protein Hsp42, and the Hsp40 protein Ydj1 readily localized to these aggregates, the Hsp26 was found to be enriched in only 15% of Hsp104-labeled foci, while no accumulation of Hsp40 protein Sis1 or the Hsp90 protein Hsp82 was detected (Figure 1C, Figure 1—figure supplement 2A–C). Importantly, age-dependent appearance of these structures was also detected in diploid cells, in other strain backgrounds (W303), independently of the MEP procedure, and when different fluorophores where used for tagging Hsp104 (Figure 1—figure supplement 2D–H), indicating that their formation represents a general, age-dependent phenomenon of budding yeast cells. Replicative aging leads to the formation of age-associated protein deposit. (A) Representative images of cells expressing endogenous Hsp104 tagged with GFP. 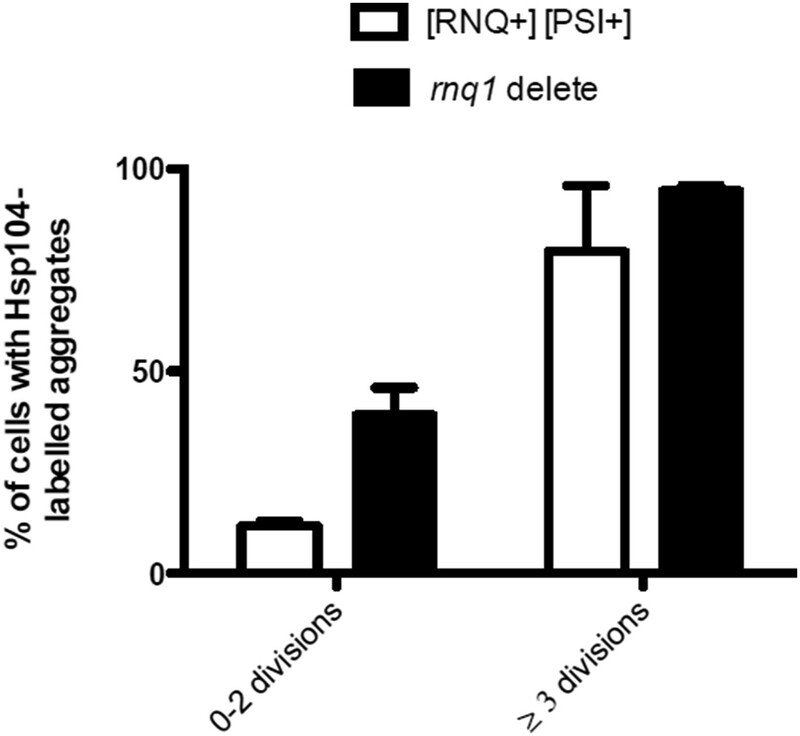 The C-terminal tagging does not hamper Hsp104 disaggregation activity (Specht et al., 2011). Cells of different age were harvested using the Mother Enrichment Program (MEP) (Lindstrom and Gottschling, 2009) and stained with calcofluor. (B) Percentage of cells of different age groups containing at least one Hsp104-focus, (N = 135 to 472 cells per age group). (C) Fraction of Hsp104-mCherry foci that are enriched with the indicated chaperones (N = 16 to 92 Hsp104-focus containing cells per strain, n.d. = not detected). (D) Representative frames of a movie of dividing cells expressing Hsp104-mCherry (black). Red arrowhead indicates an aggregate that is retained in the mother cell (M). This cell divided five times giving rise to four daughter cells that start to form aggregates after dividing 2–3 times (blue arrows at 390 min). (E) Integrated density at newly forming age-associated protein deposits (deposit/cytoplasm) over time, (N = 26). (F) Fraction of divisions during which the age-associated protein deposit is asymmetrically inherited by the mother cell as a function of the age of the mother cell (N = 66 to 306 divisions per age group from 2-3 independent experiments. The approximate mother cell age was estimated from separate bud scar analysis). (G) Representative micrographs of a dividing mother cell expressing Hsp104-GFP followed for 66 hr in a microfluidic chip (Lee et al., 2012). (H) Proportion of cells having the indicated number of Hsp104 foci. Hsp104 foci containing cells that could be followed >10 consecutive divisions were quantified for the number of Hsp104-foci/cell at each time point, (N = 44). (I) Total time spent with and without an Hsp104-focus for cells undergoing >10 consecutive divisions, starting with a focus, (N = 44). (J) Fluorescent recovery after photobleaching (FRAP) analysis of Hsp104-mCherry turnover at age-associated protein deposit. The mCherry signal at the age-associated protein deposit was photobleached in HSP104-GFP/HSP104-mCherry diploid cells and the kinetics of recovery were monitored, using the GFP signal to localize the age-associated protein deposit over time. (K) Fitting of nine recovery curves showed that on average a large (59%) fraction was immobile and the half-time recovery for the mobile fraction was 8.9 s, (N = 9). Scale bars 5 μm. Graphs display mean ± SEM, *p < 0.05, ***p < 0.001. To characterize the nature of these protein deposits further, we performed live-cell imaging by acquiring images every 15 min over several hours and covering the entire depth of the cell. This showed that most mother cells started to form this aggregate already after budding three to four times (Figure 1D, 390 min). The fastest growth phase of the aggregate took place during the first half an hour following its detection, after which the Hsp104 signal intensity increased only marginally (Figure 1D,E). While the aggregates initially underwent occasional dissolution, they became stable within a few hours from nucleation (Figure 1E). Pedigree analysis of aggregate inheritance in cells of different age showed that they faithfully segregated to the aging mother cell (98% of divisions), irrespective of its age (Figure 1D,F, Video 1). To further analyze the persistence and behavior of the deposits over the entire replicative life span of cells, we used a microscope-coupled microfluidic dissection platform (Lee et al., 2012) (Figure 1—figure supplement 1B). This showed that the aggregate was efficiently maintained as one compartment, and whenever new foci emerged, they typically merged soon after with the pre-existing deposit. We quantified the number of Hsp104 foci (1 or >1) and its post-nucleation stability in cells that were tracked for at least 10 divisions after the aggregate had appeared. These cells preferentially (>80% of time) displayed only a single Hsp104 focus (Figure 1G–H), which was very stable, typically persisting until the last divisions of the cell (Figure 1G,I). Moreover, this structure was largely non-dynamic, displaying limited exchange of Hsp104 with the cytoplasm, as determined by fluorescent recovery after photobleaching (FRAP) analysis in diploid cells that expressed one GFP- and one mCherry-tagged copy of HSP104 (Figure 1J). We bleached and measured the recovery of the mCherry signal (Figure 1J) and by fitting nine recovery curves, found that on average a large fraction (59%) of Hsp104 was immobile, while the mobile fraction displayed a half-time recovery rate of 8.9 s (Figure 1K). Together, these data show that a large majority of unstressed yeast cells develop a protein deposit early during replicative aging. 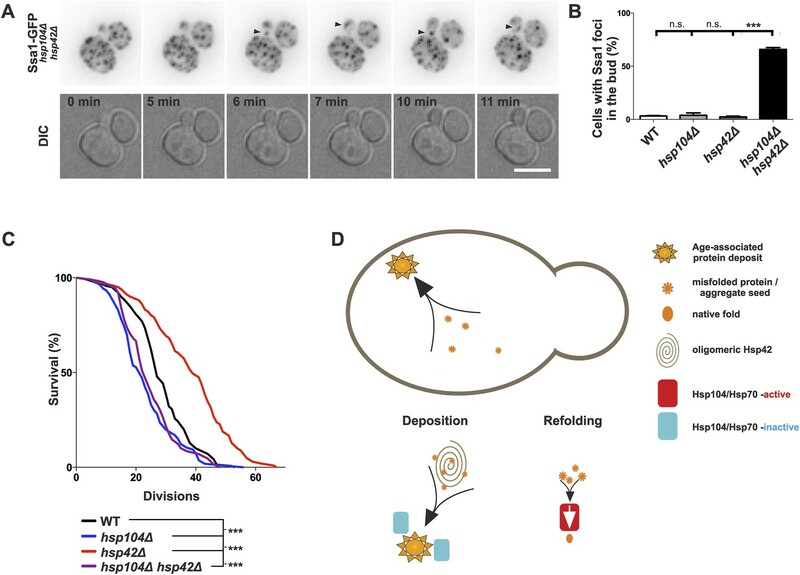 This deposit displays limited exchange with the cytoplasm (assessed by Hsp104), is efficiently maintained as a single compartment, and is faithfully inherited by the aging mother cell. Age-associated protein deposit is a stable structure that is faithfully inherited by the aging mother cell lineage. Aged yeast cell expressing Hsp104-mCherry (in green) to mark protein aggregates and Cdc10-GFP (in red) to mark the mother bud interface undergoing four consecutive divisions. To better understand how the age-associated protein deposit forms and what are its physiological constituents, we selected two proteins containing glutamine- and/or asparagine-rich domains, Sup35 and Dcp2, which are known to undergo conformational switches and to aggregate, and we monitored their localization in respect to the age-associated protein deposit. Sup35 (eRF3) is a translation termination factor that can undergo stable amyloid-like prion conversion from non-prion [psi–] to prion state [PSI+] (Chernoff et al., 1993; Ter-Avanesyan et al., 1994; Wickner, 1994; Patino et al., 1996; Paushkin et al., 1996). Thus, we tested whether Sup35-GFP is targeted to the age-dependent aggregate and if the prion status plays a role in the targeting to and/or in the formation of the age-associated protein deposit. Importantly, Sup35-GFP clearly accumulated into Hsp104-mCherry-labeled age-associated protein deposit in 33% of [PSI+] cells that contained such a deposit, whereas no accumulation was detected in the non-prion [psi−] cells (Figure 2A–C). As expected, the formation of this bright Sup35 focus was age-dependent (Figure 2D), in line with earlier observations (Derdowski et al., 2010), but interestingly the [PSI+] state did not have an overall effect on Hsp104-labeled deposit formation (Figure 2E). Similarly, the elimination of the [RNQ+] prion by deleting RNQ1 did not negatively influence the formation of the age-associated deposit (data not shown). Notably, time-lapse imaging showed that Sup35 was recruited into the pre-existing age-associated protein deposit (marked by Hsp104-mCherry). These Sup35-enriched age-associated protein deposits segregated asymmetrically towards the aging mother cell in 98% of mitoses (Figure 2F,G). These data provide evidence that the Hsp104-labeled focus is a bona fide deposit site for aggregating proteins, and that prion conversion of Sup35 promotes its gradual storage into the age-associated protein deposit, but does not potentiate its formation per se. Prion form of Sup35 is deposited to the age-associated protein deposit. (A, B) Co-localization of Sup35-GFP and Hsp104-mCherry in diploid [psi−] (A) and [PSI+] (B) cells, where a single locus of the respective gene was tagged with the fluorescent marker indicated. White arrowhead indicates the age-associated protein deposit (Hsp104 positive) and the red arrowhead Sup35-aggregates not associated with the age-associated protein deposit. (C) Percentage of age-associated protein deposits in [psi–] and [PSI+] cells with enriched Sup35, (N = 130). (D) Percentage of cells with large Sup35-foci in cells of indicated age groups (N = 157–184 cells pre age group, average age young [psi–] 1.1, young [PSI+] 1.1, aged [psi–] 6.9, aged [PSI+] 5.9 generations). (E) Percentage of [psi–] and [PSI+] cells of the indicated age group (see D) containing an age-associated protein deposit, (N = 157–184 cells pre age group). (F) Time-lapse images of a [PSI+] cell co-expressing Sup35-GFP (green) Hsp104-mCherry (red) at the indicated time points. Arrowheads point at the age-associated protein deposit as observed in the different channels. The newborn daughters are indicated in the bottom row. (G) Percentage of divisions where the Sup35-GFP-labeled age-associated protein deposit is retained in the aging mother cell lineage, (N = 204 divisions). (H) Fluorescent images of a cell co-expressing the P-body protein Dcp2 tagged with GFP and Hsp104 tagged with mCherry. (I) Percentages of cells of indicated age groups that contain the indicated fluorescent foci, (N = 18–71 per group). (J) Time-lapse, fluorescent images of Dcp2-GFP and Hsp104-mCherry expressing cells at the indicated time points after switching the cells to 0.1% glucose. Scale bars (A, B, H, J) 5 μm, (F) 2 μm. Graphs display mean ± SEM. In contrast, Dcp2, a Q/N-rich component of the reversible P-body mRNP aggregates (Reijns et al., 2008), did not accumulate into the age-associated deposit (Figure 2H,I), even after induction of P-body formation by reducing the glucose level in the medium to 0.1% (Decker et al., 2007) (0/57 Hsp104 foci with Dcp2-GFP, Figure 2J). Furthermore, we never observed age-associated protein deposits and P-bodies fusing with each other (Figure 2J). This suggests that P-bodies and age-associated protein deposits have different physicochemical properties, representing two distinct modes of cytosolic sub-compartmentalization (Hyman et al., 2014; Kroschwald et al., 2015). Altogether, these data show that the substrates of the age-associated deposit are non-random and possibly amyloid-like, which might explain their irreversible nature. During recent years, numerous distinct protein deposits, including Q-bodies, JUNQ/INQ, and the IPOD, have been discovered and thus we wanted to explore whether the age-associated protein deposit matches the identity of any of these structures. We first looked at the behavior of Q-bodies, which assemble in response to heat-stress. In stark contrast to the age-associated aggregates (Figure 1G,I), Q-bodies induced upon heat stress (42°C, 30 min) were transient and readily solubilized after the removal of the stress factor (Figure 3A; Liu et al., 2010; Escusa-Toret et al., 2013; Wallace et al., 2015). Comparative analysis of the localization of different chaperone proteins between Q-bodies and the age-associated protein deposit showed that all markers of the age-associated protein deposit were also found to accumulate in Q-bodies (Figure 3B). Conversely, we found chaperones such as Hsp82 and Btn2 localizing to Q-bodies (Figure 3B) albeit being excluded from the age-dependent protein deposit (Figure 1C). Together, the reversible nature and the difference in associated chaperones demonstrate that the Q-bodies and age-associated protein deposits can be distinguished. The age-associated protein deposit can be distinguished from Q-bodies, JUNQ/INQ, and IPOD. (A) Cells were heat shocked (42°C for 30 min) to induce the formation of Q-bodies (stress induced Hsp104-labeled aggregates) and the kinetics of Q-bodies dissolution was followed with time-lapse microscopy of Hsp104-GFP. (B) Cells were imaged after heat shock (42°C for 30 min). Arrowhead in 3D-projected images depicts co-localization of Hsp104 with age-associated deposit-resident (Ssa1, Hsp42) and non-resident (Hsp82, Btn2) markers in Q-bodies (compare with Figure 1C). (C) The expression of JUNQ/INQ marker VHL-GFP was induced at the start of the imaging to follow its recognition by Hsp104-mCherry. (D) Quantification of VHL-GFP foci recognized by Hsp104-GFP within 30 min of their appearance (N = 29 cells). (E) 3D-projected images of RPN4 deleted cells expressing Hsp82-GFP and Hsp104-mCherry. Hsp82-GFP, which localizes to Q-bodies (Figure 3A) but not to age-associated protein deposits (Figure 1C), co-localizes with one of the two Hsp104-mCherry foci in aged cell (see fluorescence intensity line-scan over the two foci). (F) 3D-projected image of Btn2-GFP and Hsp104-mCherry expressing cell. Btn2 is typically very low abundant and does not accumulate (98.6% of cases, N = 72) to the age-associated deposit (white arrowhead). (G) Cell with a Btn2 focus, which typically (96.4% of cases, N = 30) did not display accumulation of Hsp104-mCherry). (H) Rnq1-overexpression was induced at the onset of imaging. The panel shows the z-sections displaying the age-associated deposit (white arrowhead in ‘merge’). (I) Quantification of newly formed Rnq1-GFP foci that accumulate Hsp104-mCherry within 30 min of their appearance (N = 53 cells). (J) Representative image of [PIN+, PSI+] cell harboring GFP-tagged endogenous Rnq1 and mCherry-tagged Hsp104. Arrowhead indicates the age-associated protein deposit. (K) Example of a [PIN+, PSI+] cell that displays an Rnq1-aggregate. Arrowhead indicates Hsp104-labeled foci, of which only one has accumulated Rnq1. Scale bars: A-B, E, J-K 5 μm, C, G 2 μm. Graphs display mean ± SEM. We then examined whether the age-associated protein deposit would bear the characteristics of the JUNQ/INQ compartment, which is formed during prolonged stress and/or in response to proteasome inhibition. To this end, we induced the GAL-promoter-driven expression of the JUNQ/INQ marker, the unstable proteasome substrate human von Hippel-Lindau tumor suppressor protein (VHL) (Kaganovich et al., 2008; Miller et al., 2015), and monitored the accumulation of Hsp104-mCherry into the newly forming VHL-foci. VHL typically formed a single focus, which in 87% of the cases did not accumulate Hsp104-mCherry within 30 min after its appearance (Figure 3C,D, N = 29). However, the VHL expression was often associated with overall increased Hsp104-mCherry expression over time, suggesting that its expression activates a stress response. Hence, we visualized the JUNQ/INQ without over-expression of exogenous substrates. To accomplish this, we used an Hsp82-GFP, Hsp104-mCherry expressing strain deleted of the RPN4 gene, leading to increased burden of proteasomal substrates, due to decreased amount of functional proteasomes (Xie and Varshavsky, 2001). Indeed, many of rpn4Δ cells displayed numerous Hsp82-Hsp104 double-positive Q-body-like puncta (data not shown). In addition, we found cells that displayed two puncta: a Hsp104-Hsp42 double-positive JUNQ-like deposit, and a Hsp104-positive, Hsp82-negative deposit that fills the criteria of the age-associated deposit (Figure 3E). To consolidate this further, we investigated the co-localization of the endogenous JUNQ/INQ marker Btn2 (Miller et al., 2015) together with the age-associated protein deposit (Hsp104). This analysis showed that in 98.6% of the cases, Btn2 did not localize to the age-associated Hsp104-foci (Figure 1C and Figure 3F). Moreover, from all thirty identified cells displaying endogenous Btn2 foci, we found only one case in which Hsp104 was enriched at this site (Figure 3G, N = 1268 cells). Together, these data suggest that the age-associated protein deposit and the JUNQ/INQ are discrete structures that may exist in parallel. Finally, we monitored the resemblance between the age-associated protein deposit and IPOD. To visualize cells during IPOD appearance, we imaged Hsp104-mCherry-expressing cells together with the canonical IPOD marker, the galactose-inducible Rnq1-GFP (Kaganovich et al., 2008), immediately after placing cells to galactose-containing media. This showed that the IPOD typically appeared as a single focus to which Hsp104 rapidly accumulated (Figure 3H,I) (>98% of Rnq1-foci displayed accumulation of Hsp104 within 30 min after their appearance, N = 53). However, by dissecting the Rnq1-GFP appearance dynamics in cell with a pre-existing age-associated protein deposit (marked by Hsp104-mCherry), we found that the aggregating Rnq1-GFP did not accumulate to the age-associated deposit (see white arrowhead in Figure 3H), but rather it formed a new aggregate to which Hsp104 then strongly accumulated, while its intensity at the age-associated protein deposit declined (Figure 3H). To rule out possible artifacts induced by Rnq1-GFP over-expression, we also looked at the co-localization between the age-associated protein deposit and GFP-tagged endogenous Rnq1 in its prion [RNQ+]-state. We analyzed altogether 117 Hsp104 foci-containing [PIN+, PSI+] cells and found that in 98.3% of the cases, Rnq1-GFP did not accumulate to this deposit (Figure 3J). Within this cohort, we found two cells with an Rnq1-GFP-aggregate, which was in both cases enriched with Hsp104-mCherry (Figure 3K). However, both of the Rnq1-aggregate containing cells also displayed an additional Hsp104 focus to which Rnq1 had not accumulated (Figure 3K). Together with the results from the Rnq1 over-expression, these data suggest that Rnq1 aggregate is likely to represent a structure that is different from the majority of the age-associated protein deposits. In sum, these data point out marked differences between the age-dependent protein deposit and the previously characterized Q-bodies, IPOD, and the JUNQ/INQ that could derive from context dependent (stress vs aging) differences in cellular responses to protein aggregation. Appearance of protein aggregates has commonly been associated with defects in protein quality control (Tyedmers et al., 2010a). Therefore, we wanted to elucidate if the formation of the age-associated protein deposit is a sign of defective protein quality control. First, we examined whether aged cells display a decline in dealing with proteotoxic stress. As shown before, young cells clear heat-induced protein aggregates (Q-bodies) rapidly after stress removal (Figure 3A). Hence, we first wanted to test if this recovery period is affected by the age of the cell (Figure 4A). We measured the clearance time of Q-bodies (defined as two or more Hsp104 foci) between young (average age 0.4 generations, between 0 and 1 generations, N = 70) and aged cells (average age 9.2 generations, between 6 and 19 generations, N = 50) following acute heat stress (Figure 4B). Surprisingly, no difference in the mean time of protein aggregate clearance was detected between these populations: young: 71 ±5 min old: 72 ±4 min, n.s.) (Figure 4C), suggesting that aged cells, despite having a protein deposit, are fit to cope with proteotoxic stress. Aged cells are not impaired in handling proteotoxic stress. (A) Experimental scheme. (B) Representative image of displaying the dynamics of recovery from heat shock induced proteotoxic stress (Q-bodies) between aged (red star) and young cell (blue star). (C) Q-body clearance time of individual cells of the indicated age groups, (old: average 9.2 generations, age between 6 and 19, N = 50; young: 0.4 generations, age between 0 and 1, N = 70). (D) Experimental scheme: Hsp104-mCherry-expressing cells were captured on a temperature-controlled microfluidic device and imaged prior (−50 min), during (30 min) and after (up to 300 min) mild heat shock. It is important to note, that the strength of the heat stress induced on the microfluidic platform is not comparable with Figure 3A,B and Figure 4A–C. (E) Single cell analysis of Q-body formation (cells with >1 Hsp104-foci) in cells with a pre-existing age-associated protein deposit (red line, N = 53), cells without a pre-existing deposit (blue line, N = 97), and cells that did not experience stress (N = 82). Data from two independent experiments. (F) Transitions in the aggregate state were recorded 50 min before the heat stress and 300 min after the heat stress. (G) Quantification of transitions (N = 32–77 per group, from two independent experiments). White bars indicate cells that did not experience heat stress and red bars denote transitions in aggregate state in heat-stress experienced cells. Scale bar 5 μm. We then used a temperature-controlled microfluidic device that enabled us to categorize cells depending on their pre-stress age-associated protein deposit-status, and monitor them under the microscope prior to, during and after undergoing acute proteotoxic stress conditions (Figure 4D). The duration of the Q-body response (state in which cells display two or more Hsp104-foci) was plotted over time and demonstrated that cells with and without a pre-existing age-associated deposit showed a comparable Q-body response when heat was applied, while cells that were not exposed to heat did not show similar Q-body response during this time period (Figure 4E, N = 53–97 cells). Interestingly, the deposit-containing cells responded slightly faster and to a lesser extend when compared to their clonal counterparts without a pre-existing protein deposit (Figure 4E). We then asked if exposure to proteotoxic stress (Q-body state) would promote the formation of age-associated protein deposits. To this end, we compared the aggregate status of single cells (Hsp104-mCherry: no/one/several puncta) at time points 0 and 380 min, between stress-experienced (between 50 and 80 min) and non-stressed (constantly at 30 °C) cells (Figure 4F, N = 32–77 per group). This analysis showed that the majority of non-stressed cells (62.5%) without a deposit at the beginning of the experiment displayed a single aggregate at the end of the experiment (Figure 4G), in accordance with the appearance kinetics of age-associated deposit (Figure 1B,D). Surprisingly, when the cells without a prior aggregate encountered heat stress (i.e. conditions that induce proteotoxic stress), a substantially smaller portion of them (36.4%) displayed an aggregate at the end of the experiment (Figure 4G). Similarly, there was a slight increase of cells without an aggregate in the stress-encountered cohort (17.7% vs 6.8%) among cells that displayed an age-associated deposit at the beginning of the experiment (Figure 4G). However, irrespectively of stress, cells with an age-associated deposit at the beginning of the experiment preferentially displayed a single deposit at the end of the experiment (non-stressed 82%, stress-experienced 79%) (Figure 4G). These results indicate that mild exposure to proteotoxic stress conditions counteract the formation of age-associated protein deposits and demonstrate that cells with an age-associated deposit prior to encountering the stress predominantly reverted back to this state. Altogether, these data indicate that despite forming a protein deposit, aged cells are still fit to coping with acute proteotoxic stress and suggest that the formation of the age-dependent protein deposit is not due to the overload of the general quality control machinery. The notion that aged cells with a protein deposit handled proteotoxic stress comparably to their young counterparts prompted us to test the effect of the age-associated deposit on the function of the ubiquitin–proteasome system (UPS), which has an important role in yeast replicative aging (Kruegel et al., 2011). Pathological polyQ protein fragments have been shown to impair the UPS function both in yeast and mammalian cells (Bennett et al., 2005; Park et al., 2013), and UPS substrates have been shown to accumulate in aged cells (Andersson et al., 2013). On the other hand, stress-induced protein aggregates (Q-bodies) do not result from failed protein degradation, but may actually benefit the proteostasis of cells undergoing stress (Escusa-Toret et al., 2013). We therefore wanted to analyze the contribution of the age-associated deposit on the functionality of the UPS. In order to selectively measure the effect of the age-associated protein deposit on UPS function, we made use of the auxin-inducible degron (AID) system (Nishimura et al., 2009), which enabled us to measure the degradation rate of cytosolic (AID-GFP) and nuclear (AID-GFP-NLS) UPS substrates in vivo (Figure 5A,B). 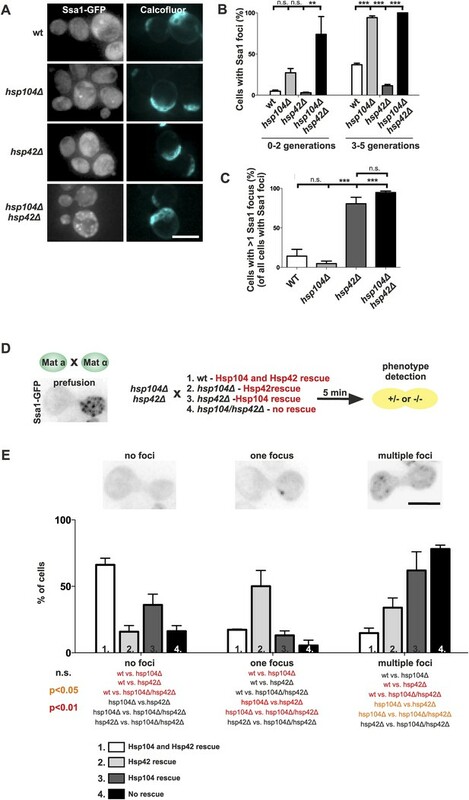 Cells co-expressing Hsp104-mCherry and AID-GFP were switched to auxin-containing media at the onset of imaging, and the GFP intensities were measured over time from neighboring cells containing or not an Hsp104-puncta. The normalized values were pooled and fitted with a non-linear one-phase decay function. Importantly, this showed that the decay rate of AID-GFP was significantly accelerated in cells with an age-associated deposit when compared to neighboring cells that did not contain an Hsp104-focus (Figure 5C,D) (rate constant (K): 0.155 ± 0.007 (with) vs 0.129 ± 0.006 (without), p < 0.01, N = 91 cells/category). However, no difference was detected in the decay rate of nuclear GFP between cells with or without an age-associated protein deposit (Figure 5E,F) (K: 0.075 ± 0.004 (with) vs 0.079 ± 0.005 (without), n.s. ), demonstrating that the effect of the age-associated protein deposit on the UPS function is specific to the cytosolic compartment. Collectively, these results suggest that the age-associated deposit promotes cytosolic quality control by enabling more efficient clearance of degradation substrates. Presence of age-associated protein deposit promotes the function of cytosolic ubiquitin–proteasome system in vivo. (A) Schematic representation of the auxin-induced degron (AID)-system (Nishimura et al., 2009). Addition of auxin facilitates the recognition of the degron-motif in the target protein (GFP) by the exogenously expressed Arabidobsis thaliana E3 ligase SCF-Tir1 and subsequent ubiquitination and degradation by the endogenous ubiquitin–proteaome system (UPS). (B) Representative images of cells expressing Hsp104-mCherry and AID-GFP taken immediately (0 min) and 48 min after auxin-addition. (C) Examples of time frames GFP degradation in the absence of auxin (upper panel) in the presence of auxin in cells with (middle) or without (below) an age-associated protein deposit. (D) The decay rates of GFP in the indicated groups. The error bars depict the normalized intensity values (average ± SEM) derived from 53 (ctrl) and 91 (auxin added) cells from three pooled replicates. The solid lines indicated non-linear one-phase decay fit. (E) GFP-NLS decay in the representative groups. (F) The decay rates and the graph fitting of NLS-GFP in the indicated groups as in (D). N = 15 (ctrl), 65–66 (auxin added) cells from three pooled replicates. The error bars depict the normalized intensity values (average ± SEM), while the solid lines indicate the non-linear one-phase decay fit. Next, we wanted to understand what are the assembly principles of the age-associated deposit. Molecular chaperones generally recognize, refold, or sort aberrantly folded proteins, making them prime candidates to regulate the age-associated protein deposit assembly. Thus, we addressed the contribution of chaperones localizing to the age-associated protein deposit to its formation. Time-lapse microscopy showed that in 24 out of 25 cells, Hsp42 was at the age-associated protein deposit before Hsp104 and was the first protein we find to mark this structure (Figure 6A). Ssa1 and Hsp104 were recruited subsequently, appearing concurrently up to 120 min after appearance of the Hsp42-focus (Figure 6A and data not shown). To identify the role of these chaperones in the assembly of the age-associated protein deposit, we investigated the consequences of their deletion. Interestingly, loss of the Hsp70 proteins Ssa1 and Ssa2, which act synergistically with the disaggregase Hsp104 in protein refolding (Glover and Lindquist, 1998; Kim et al., 2013), resulted in rapid formation of the Hsp104 focus (Figure 6B,C) and a similar, but milder effect was detected upon deletion of HSP26. In stark contrast, deletion of HSP42 abolished age-associated protein deposit formation (Figure 6B,C), which parallels to its function in Q-body assembly (Specht et al., 2011; Escusa-Toret et al., 2013). To probe the role of Hsp104 and Hsp42 further, we analyzed the consequences of their over-expression on age-associated protein deposit formation (monitored by endogenous Hsp104-GFP). Over-expression of Hsp42 caused precocious nucleation of age-associated protein deposit and promoted its growth (Figure 6D–F). On the contrary, a significantly smaller fraction of cells over-expressing Hsp104 contained an age-associated protein deposit and while age-associated deposits still occasionally formed, they were rapidly destabilized (Figure 6D–F). Collectively, these data suggest that these chaperones functionally oppose each other (Figure 6G): the Hsp104/Hsp70 proteins prevent age-associated protein deposit formation possibly by refolding cytoplasmic substrates, whereas Hsp42 coordinates the collection of these substrates from the cytoplasm into the age-associated protein deposit (Figure 6G). Identification of the roles of chaperones in age-associated protein deposit assembly. (A) Representative time-lapse images of cells expressing endogenously tagged Hsp42-GFP (upper panel) and Hsp104-mCherry (middle panel). Arrowhead depicts the age-associated protein deposit structure. (B) Representative images of aged Hsp104-GFP expressing wild-type, ssa1Δ, and hsp42Δ mutant cells. (C) Quantification of Hsp104-foci containing cells in indicated age groups, (N = 317–1020 cells per genotype). (D) Time-lapse images of cells expressing endogenous Hsp104-GFP in wild-type, Hsp104 over-expressing, and Hsp42 over-expressing cells (age-associated protein deposit depicted by a red arrowhead). (E) Quantification of percentage of cells with age-associated protein deposit in wild-type, Hsp104 over-expressing, and Hsp42 over-expressing cells of indicated age groups (N = 432–1020 cells per genotype). (F) Quantification of endogenous Hsp104-GFP integrated density (age-associated protein deposit/cytoplasm) following its appearance in wild-type (black line) and Hsp42 over expressing cells (red line), (N = 19–23). (G) A summarizing model of the pathway underlying age-associated protein deposit formation. Scale bars 5 μm. Graphs display mean ± SEM, n.s not significant, *p < 0.05, **p < 0.01, ***p < 0.001. To consolidate this model, we further investigated the interplay between the refolding machinery (Hsp70/Hsp104) and the nucleation/growth promoting Hsp42. We used cells expressing Ssa1-GFP to visualize the age-associated protein deposit in the absence of Hsp104 (Figure 7A). Similarly to what we found for the deletion of SSA1 and SSA2 (Figure 6B,C), the hsp104Δ mutant cells formed the age-associated protein deposit more rapidly during aging. Again, the deletion of HSP42 had an opposite effect, hampering formation of the Ssa1-GFP focus (Figure 7A,B). Remarkably, age-associated protein deposit formation was severely impaired in the hsp104∆ hsp42∆ double-mutant cells. These cells were crowded with punctate Ssa1-GFP (speckles), which failed to coalesce into a single regular age-associated protein deposit (Figure 7A,B). The portion of cells that contained multiple Ssa1-GFP foci was significantly higher in hsp104Δ hsp42Δ double-mutant cells than in hsp104Δ single-mutant cells. Interestingly, whereas >80% of wild-type and hsp104∆ mutant cells that contained an aggregate displayed a single Ssa1-GFP focus, the majority of hsp42∆ and hsp104∆ hsp42∆ mutant cells harbored several foci (Figure 7C). The assembly of age-associated protein deposit is promoted by Hsp42 and counteracted by Hsp104/Hsp70. (A) Representative aged wild-type, hsp104Δ, hsp42Δ and hsp104Δ and hsp42Δ double-mutant cells. (B) Quantification of the fraction of cells in indicated age groups that display Ssa1-GFP foci (age-associated protein deposit), (N = 363–493 cells per genotype). (C) Quantification of the portion of cells that display >1 Ssa1 foci from all Ssa1-foci containing cells, (N = 363–493 cells per genotype). (D) Illustration of the experimental scheme of the reconstitution assay. Cells that lack both HSP104 and HSP42 and display fragmented aggregate phenotype were mated with cells of the opposite mating type to reintroduce either Hsp104 and/or Hsp42. The resulting zygote was imaged with time-lapse microscopy and analyzed 5 min after fusion to score for aggregation phenotype (analyzed by Ssa1-GFP). (E) Quantification of the Ssa1-GFP phenotype (no foci, one focus, multiple foci) 5 min post fusion, (N = 73–100 fusion events per genotype). Scale bars 5 μm. Graphs display mean ± SEM, n.s not significant, **p < 0.01, ***p < 0.001. To decisively dissect the individual contributions of Hsp104 and Hsp42 on age-associated protein deposit formation, we conceived an in vivo reconstitution assay where we could rapidly re-introduce either Hsp104 or Hsp42 to the aggregate-enriched hsp104Δ hsp42Δ double-mutant cells. To accomplish this, we mated hsp104Δ hsp42Δ double-mutant cells with wild-type (re-introducing both Hsp104 and Hsp42), hsp104∆ single-mutant (to reintroduce only Hsp42), hsp42Δ single-mutant (to reintroduce only Hsp104), or with the hsp104 hsp42 double-mutant cells (reintroducing none of the chaperones) (Figure 7D). We monitored the deposit by imaging the fusing cells at 1-min intervals, using Ssa1-GFP as a reporter (Figure 7D). Importantly, simultaneous reintroduction of Hsp104 and Hsp42 was sufficient to clear the cytoplasm of Ssa1-GFP speckles already within 5 min (Figure 7E, no foci). In contrast, introducing Hsp42 alone resulted in rapid disappearance of cytoplasmic speckles with concurrent formation of a single Ssa1-GFP focus (Figure 7E, one focus). In contrary, reintroduction of only Hsp104 led to the slow and incomplete clearance of the Ssa-1 speckles, which was a reminiscent, but a milder phenotype as that observed upon conjugating the cell with hsp104Δ hsp42Δ double-mutant partner (Figure 6E, multiple foci). Collectively, this analysis supports the conclusion that Hsp42 functions to collect aggregates into the age-associated protein deposit structure, whereas Hsp104 functions to disaggregate/refold age-associated protein deposit destined substrates. In the context of the age-associated protein deposit cargo Sup35 (Figure 2), it is interesting to note that Hsp42 over-expression promotes [PSI+] curing, while its deletion results in enhanced [PSI+] induction, further supporting its role as the depositor for the age-associated protein deposit (Duennwald et al., 2012). We then asked whether age-associated protein deposit formation ensures the asymmetric inheritance of protein aggregates by the aging lineage. Examining its mitotic segregation (monitored with Ssa1-GFP) in 96 wild-type and 186 hsp104Δ mutant cell divisions demonstrated that the age-associated protein deposit was in both cases inherited by the aging mother cell with high fidelity (in 98% of divisions; data not shown). In strong contrast, Ssa1-GFP foci were frequently inherited by the daughter cells when both HSP104 and HSP42 were deleted (Figure 8A, Video 2). By examining 61 mitotic events by time-lapse microscopy in the double-deleted cells, we observed Ssa1-GFP-foci relocating from the mother to the bud in 53 cases, but did not find any biased retrograde movement from the bud to the mother (Fig. 8A, Video 2 and data not shown). Quantification of the percentage of buds with protein deposits demonstrated that more than 65% of all hsp104Δ hsp42Δ double-mutant buds displayed at least one aggregate, compared to less than 4% in hsp104Δ and hsp42Δ single-mutant and in wild-type cells (Figure 8B). 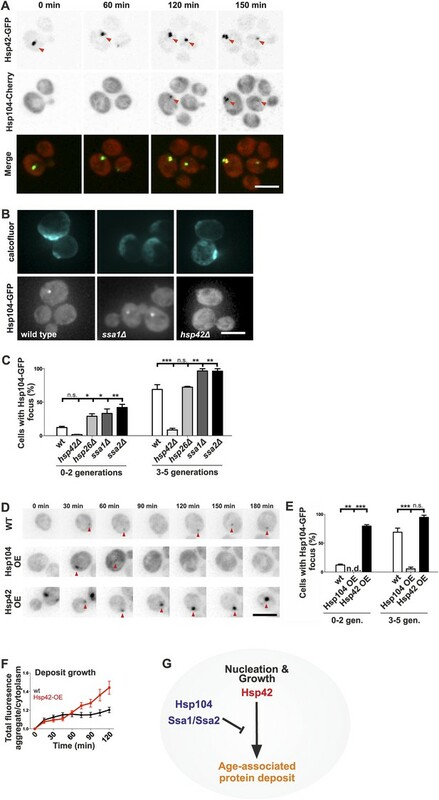 Altogether, these data provide evidence that collection of protein aggregates into a single deposit by Hsp42 promotes their asymmetric retention in the mother cell during cell division. Age-associated protein deposit formation establishes asymmetric inheritance of protein aggregates and correlates with replicative age. (A) Time-lapse imaging of Ssa1-GFP in hsp42Δ hsp104Δ double-mutant cells (arrowheads denote Ssa1-GFP aggregates relocating from the mother cell to the bud). (B) Quantification of Ssa1-GFP foci found in the buds of mitotic yeast cells (N = 216–434 buds per genotype). (C) Replicative aging experiments of wild-type (black line, 27 generations), hsp104Δ mutant (blue line, 21.5 generations), hsp42Δ mutant (red line, 39 generations), and hsp104Δ and hsp42Δ double mutant (purple, 23 generations) single cells, (N = 101–140 cells per genotype). (D) A schematic model for the age-associated protein deposit pathway: Hsp42 acts as a collector of protein aggregate seeds and promotes their deposition at the ER membrane ensuring their asymmetric inheritance by the aging lineage during mitosis. These cytoplasmic seeds are subjected to Hsp104/Hsp70-dependent refolding, which is inactive (blue rectangle) at the site of the age-associated protein deposit assembly. Scale bar 5 μm. Graph displays mean ± SEM, n.s not significant, ***p < 0.001. The lack of the age-associated protein deposit assembly pathway results in the inheritance of the aggregates by the daughter cells. Expression of Ssa1-GFP was followed in hsp104Δ hsp42Δ double-mutant cell as it underwent cell division. Finally, we tested the significance of the age-associated protein deposit pathway and asymmetric protein aggregate segregation on replicative aging (Figure 8C). In accordance to previous work (Erjavec et al., 2007), mutant hsp104∆ cells were short-lived compared to wild-type cells (21.5 vs 27 generations, p < 0.001), supporting the idea that accelerated aggregate accumulation promotes aging. Further supporting this notion, deletion of HSP42 extended the lifespan of the cells by more than 40% (39 generations, p < 0.001). 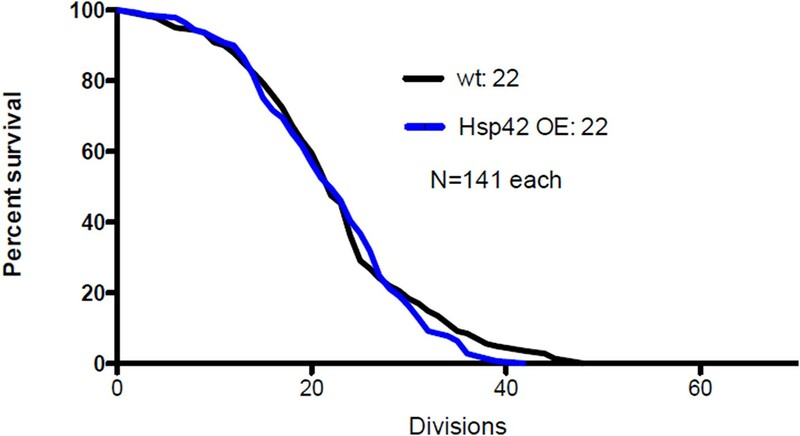 The lifespan of the hsp104Δ hsp42Δ double-mutant cells was similar to that of the hsp104Δ single-mutant cells (23 vs 21.5 generations, respectively, ns.) and significantly shorter than that of the wild-type (p < 0.01) and hsp42Δ mutant cells (p < 0.001). The over-expression of HSP42 had no effect on the lifespan (data not shown), suggesting that the wild-type levels of Hsp42 are sufficient to provide its maximal effects on life span, which is consistent with the appearance of the deposit early in life span in the wild-type cells. Together, these data imply that the Hsp104/Hsp70 system, which counteracts protein aggregation, is essential for longevity, while the Hsp42-dependent circuit promotes aging in the mother lineage, presumably by building the age-associated protein deposit and thereby establishing the asymmetric inheritance of age-associated protein aggregates. Protein aggregation has been frequently associated with aging and aging-associated diseases. Here, by using the budding yeast as a model for replicative aging, we identify an Hsp42-promoted and Hsp104/Hsp70-counteracted pathway that deposits age-associated protein aggregates and thereby ensures their biased segregation to the aging mother-lineage upon cell division (see model in Figure 7D). This might represent a common mechanism to drive asymmetric segregation of aberrant proteins in dividing cells, as stressed fission yeast cells utilize a similar Hsp16-dependent mechanism for asymmetric partitioning of misfolded proteins (Coelho et al., 2014). Intriguingly, our data suggest that depositing age-associated protein aggregates to the mother cells might be a mixed blessing. On one hand, the age-associated deposit can promote spatial protein quality control (Figures 4, 5) and promote cell diversity as an asymmetrically dividing structure that may harbor protein conformation encoded epigenetic information, such as the prion fold of Sup35 (Figure 2). At the same time, the long-term consequences of this pathway appear negative for the aging lineage (Figure 8C). Why the deposit-forming pathway ultimately becomes associated with age-dependent loss of fitness remains to be determined. In this regard, it will be of great importance to elucidate how age-associated deposit relates to other aging pathways, such as those influencing the function of mitochondria (McMurray and Gottschling, 2003; McFaline-Figueroa et al., 2011), vacuoles (Hughes and Gottschling, 2012) and nuclear pores (Shcheprova et al., 2008; Denoth-Lippuner et al., 2014; Webster et al., 2014), and how the deposit localizes relative to these organelles and their components (Chong et al., 2015). Protein deposit-containing cells efficiently coped with acute proteotoxic stress (Figure 4) and displayed improved degradation of cytosolic UPS substrate during early- to mid-life span (Figure 5). It is important to note, however, that our assays were conducted with relatively young cells that had recently acquired the protein deposit, and hence it is possible that UPS function starts to decline later during the aging process, as shown previously (Andersson et al., 2013). Curiously, the decline in proteostasis has been associated with protein aggregation pathologies such as Alzheimer's, Huntington's, and Parkinson's disease (Vilchez et al., 2014). The decreased degradation of cytosolic UPS substrates in a polyQ disease model was found to be due to the sequestration of the Hsp40 protein Sis1 (Park et al., 2013)—a protein that was not associated with the age-associated deposit (Figure 1C). It is thus plausible that the presence of the deposit might, for example, lead to increased levels of available (substrate unbound) Sis1, thereby allowing more efficient nuclear import and degradation of cytosolic UPS substrates. Altogether, these data suggest that there is a need to better differentiate between pathophysiological protein aggregation and ‘homeostatic’ protein aggregation that takes place during physiological aging, of which the latter might initially help to coordinate chaperones and UPS factors involved in protein quality control. Related to this, the age-associated protein deposit did not clearly fill out the set criterion for any of the previously characterized cytosolic deposits, including Q-bodies, JUNQ/INQ, or IPOD, but rather seems to exist in parallel with the JUNQ and IPOD structures (Figure 1, Figure 3)—although, for example, the chaperones regulating these deposits were often shared between these structures. This favors the notion that pathological aggregation processes (mimicked e.g., by VHL and Rnq1 over-expression) can hijack endogenous proteostasis regulatory mechanisms, possibly underlying their harmful effects in cells (Park et al., 2013). Altogether, these apparent differences between the stress-induced, pathological, and aging-associated protein aggregates (Figure 2, Figure 3) demonstrates that protein aggregates are not all equal in their composition or in the way they are being recognized and dealt by the cell and reinforces the importance to discriminate between different aggregation models. In the future, it will be important to identify the cargo deposited to the age-associated protein deposits. In this aspect, it is interesting to note that many of the long-lived asymmetrically retained proteins that accumulate to mother cells as they age (Thayer et al., 2014) were among those localizing to the age-associated protein deposit (including Hsp104, Ssa1, Ssa2, and Hsp26). One example of an age-associated deposit resident protein was the prion-like Sup35. This storage rendered Sup35 to be inherited by the mother cells (unlike a prion, analogous to a mnemon (Caudron and Barral, 2013)) (Figure 2), which is consistent with the size-dependent transmission model of Sup35-aggregates (Derdowski et al., 2010). However, aging does not enhance Sup35-dependent [PSI+] prion generation (Shewmaker and Wickner, 2006). Together, these notions suggest that Sup35 cannot escape the age-associated deposit under normal growth conditions, perhaps owing to the rigid amyloid-like packing (Saibil et al., 2012), being consistent with the durable and non-dynamic nature of these deposits. However, this notion may come with a caveat: we found that the age-associated deposit could be, at least temporarily, disassembled by the heat shock response (Figure 4). This suggests the captivating possibility that changes in the environment might trigger the spread from the age-associated deposit. For cells facing fluctuating environments in the wild, the strategy to stochastically store prion-like proteins in aged cells might prove beneficial, as it could allow stress-dependent spread of the prion conformers from a subpopulation of aged-cells to their daughters, promoting faster adaptation to the changing environment (Newby and Lindquist, 2013). Since asymmetric inheritance of damaged proteins and protein aggregates seems to be conserved in metazoan stem cells (Rujano et al., 2006; Bufalino et al., 2013) that are also subjected to both replicative decline and segregation of lineages, we hypothesize that similar pathways that selectively segregate protein-aggregate based fate determinants asymmetrically during cell division are likely to be conserved and may contribute to cellular lineage specification across species. Yeast strains used in this study are listed in Supplementary file 1. Strains were generated either manually (Janke et al., 2004) or derived from collections: (http://web.uni-frankfurt.de/fb15/mikro/euroscarf/col_index.html or http://clones.lifetechnologies.com/cloneinfo.php?clone=yeastgfp). Plasmids (pAG415-GDP) over-expressing Hsp104 (O-1360) and Hsp42 (O-2252), and the [PIN+][PSI+] (yJW508) and [PIN+][psi–] (yJW584) parental strains (Osherovich and Weissman, 2001) were a generous gift from Simon Alberti (Max Planck Institute of Molecular Cell Biology and Genetics Dresden, Germany). The Mother Enrichment parental strains (Lindstrom and Gottschling, 2009) were a kind gift from Dan Gottschling (Fred Hutchinson Cancer Research Center, Seattle USA) and the plasmids encoding VHL-GFP and Rnq1-GFP were provided by Judith Frydman (via Addgene). The integrative plasmids for the auxin-mediated degradation assays (pADH1-OsTIR1-9myc, pADH1-eGFP-IAA17-NLS, pADH1-eGFP-IAA17) have been described in (Nishimura et al.) and were kindly provided by Matthias Peter (ETH Zurich, Switzerland). Cells subjected to imaging were re-inoculated from overnight cultures to O.D. 600 nm 0.05 in YPD and grown to O.D. 0.5–0.8 at 30°C, centrifuged 500 g for 5 min, resuspended in synthetic complete (SC) media (-his), and mounted between a coverslip and an agar pad (SC-his). The over-expression of Rnq1-GFP and VHL-GFP was induced by switching cells to 2% galactose at the onset of imaging. The auxin-mediated degradation assays were performed similarly as above by placing cells to 0.5 mM 3-Indoleacetic acid (Sigma–Aldrich, #12886) at the onset of imaging. The MEP was performed as described in (Lindstrom and Gottschling, 2009). Briefly, cells were grown in log phase for 15 hr before coupling the cell wall with Sulfo-NHS-LC-Biotin (Pierce). Following 2 hour recovery period, the MEP was engaged by addition of estradiol to a 1 μM final concentration. After desired incubation period, cells were coupled to uMACS Streptavidin MicroBeads (Miltenyi Biotec) and affinity purified with MACS separation columns (Miltenyi Biotec). Calcofluor staining was done by incubating cells with 5 μg/ml Fluorescent Brightener 28 (Sigma–Aldrich) for 1 min prior to centrifugation and resuspension to SC media. The Q-bodies were induced by incubating cells in a water bath at +42 °C for 30 min, or by using a temperature-controlled microfluidic chamber (see microfluidics). For the mating experiments, cells (1.85×107) of the opposite mating type were centrifuged 500 g for 5 min and resuspended to 40 μl SC media, mixed and immediately imaged with 1-min intervals (see microscopy for details). Wide-field microscopy was performed at 30 °C with a DeltaVision microscope coupled to a coolSNAP CCD HQ2 camera (Roper), 250W Xenon lamps and 100X/1.40 and 60x/1.42 NA Olympus oil immersion objectives. Z-sectioning was performed with 500-nm spacing (unless otherwise indicated), obtaining 9 or 11 (live-cell imaging) or 15 (calcofluor stained cells) stacks. Images were deconvolved with Softworx software (Applied Precision). Microfluidics on the aging chip were imaged with a DeltaVision microscope every 45 min for total of 66 hr by obtaining seven z-sections with 0.6-μm spacing. FRAP was done with temperature-controlled Zeiss LSM 510 microscope controlled with AIM LSM4.0 software, 63x 1.4NA Oil DIC Plan-Apochromat objective at 30°C, using DPSS and Argon lasers. Diploid cells expressing HSp104-GFP/Hsp104mCherry were imaged every 5 s at three z-planes with 800-nm spacing five times before bleaching the mCherry signal at the age-associated protein deposit with 100% DPSS laser power, after which the recovery of mCherry at the age-associated protein deposit was monitored over the period of two minutes by orienting with the GFP-signal. The temperature ramp experiments (Figure 4) were carried out with ONIX microfluidic perfusion system equipped with a micro-incubator temperature controller CellASIC), using Y04C microfluidic plates (CellASIC). The temperature setup was the following: 30°C (50 min), 42°C (30 min) 30°C (300 min) and the cells were imaged every 10 min as described in (microscopy). The experiments were carried out in synthetic full medium with even flow rate of 2 psi. Microfluidics on the aging chip was performed with 1.5 μl/min flow rate as described in (Denoth-Lippuner et al., 2014). All image analyses were performed with Image J software (http://imagej.nih.gov/ij/). 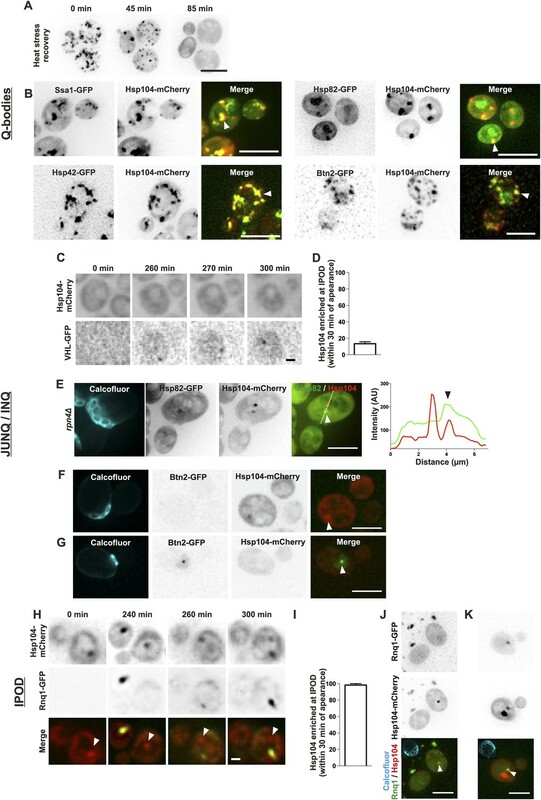 The aggregation foci were scored by eye from maximum intensity projected images (spanning the entire volume of the cell) and were defined as puncta that display high-intensity over the surrounding cytoplasmic background signal. For age-associated protein deposit intensity measurements, the integrated density was measured at the site over time at the age-associated protein deposit from stacked, non-processed sum-projected videos and was then normalized to the cytoplasmic Hsp104-GFP intensity. For the auxin-mediated degradation experiments, the 11-plane z-stack covering 5.5 μm was sum projected and an integrated density of a defined area (18 μm2 (GFP) or 16 μm2 (GFP-NLS) was measured over time from the region of interest (ROI) and the neighboring background region (BG). To distinguish between cells that contained an aggregate from those that did not contain an aggregate, cells were categorized based on the first frame Hsp104-mCherry signal into the two respective groups. The ROI values were background subtracted [ROI(t)-BG(t)] and normalized to the first value [ROI(tx)/ROI(t1)]. The average of the pooled values was fitted with Prism5 software using non-linear one-phase decay. For the FRAP analysis, raw data were background subtracted, corrected for acquisition-induced bleaching and normalized, and the curve was fitted from pooled values with Prism5 software using one-phase association non-linear fitting. The FRAP data where the aggregate structure was lost from the focal plane during recovery period image acquisition were discarded. Lifespan of virgin daughters was analyzed on YPD plates using Zeiss Axioscope 40 microdissection microscope as previously described in (Denoth-Lippuner et al., 2014). All statistical analyses and graph preparations were done with Prism5 software. The error bars represent ±SEM from experimental triplicates with independent clones and statistical analyses were conducted with one-way ANOVA using Newman–Keuls post test, t-test, or Gehan-Breslow-Wilcoxon test. The Journal of Cell Biology 179:437–449. Biochemistry and Cell Biology 88:63–75. Annual Review of Biochemistry 82:323–355. Proceedings of the National Academy of Sciences of USA 107:13348–13353. Proceedings of the National Academy of Sciences of USA 109:4916–4920. 413–422, Genetics, 183, 411SI–413SI, 10.1534/genetics.109.106229. Molecular Biology of the Cell 23:3041–3056. Trends in Cell Biology 23:251–259. Journal of Cell Science 121:2463–2472. Proceedings of the National Academy of Sciences of USA 109:14906–14911. The Journal of Cell Biology 195:617–629. Proceedings of the National Academy of Sciences of USA 111:14019–14026. Nature Reviews Molecular Cell Biology 11:777–788. Proceedings of the National Academy of Sciences of USA 107:8633–8638. The Journal of Cell Biology 198:387–404. Proceedings of the National Academy of Sciences of USA 98:3056–3061. Thank you for choosing to send your work entitled “Early differentiation of the aging lineage in yeast by a protein deposit” for consideration at eLife. Your full submission has been evaluated by Randy Schekman (Senior Editor) and three peer reviewers, and the decision was reached after discussions between the reviewers. Based on our discussions and the individual reviews below, we regret to inform you that your work will not be considered further for publication in eLife. We consider the work to be technically well done, but largely redundant with a lot of published literature – which you have not referenced properly. In addition there are specific concerns raised by the reviewers that we feel would require substantial experimental work, beyond the normal we suggest for a manuscript that could be returned with revisions. Consequently, in its current form, we believe this work does not advance the fields of aging or protein aggregation as far as other manuscripts that have been published recently in eLife. However, we do like the direction you have taken and think there are “good bones” in this work. Please take the advice of the reviewers into account in designing a new manuscript that you may wish to have us consider at a future date. 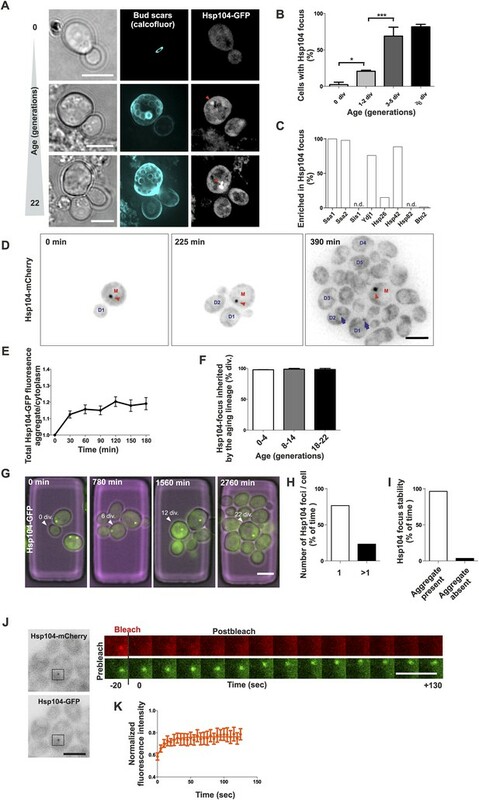 The authors observe a single dot of Hsp104-GFP that forms in mother cells after several buddings, and is retained in the mother cell indefinitely. This focus is labeled as well by Ssa1 and Ssa2 (the major cytoplasmic Hsp70s), Hsp42 (a “small” heat shock protein) and Ydj1p (an Hsp40). These foci are shown to be distinct from “Q-bodies” (multiple aggregates formed after heat-stress) or “P-bodies”. 1) There has been a proliferation of “foci” of protein aggregates. What is the relation of the AIDOPOD to the JUNQ (Kaganovich, Kopito and Frydman, 2008) locus, both of which are juxtanuclear? Are these the same aggregates that Nyquist has described (without this name) as retained in the mother cell in an Hsp104-dependent process? Are these the Hsp42 foci of aggregated proteins described by Bukau's group (Specht et al., 2011)? Btn2p forms foci of prion (Kryndushkin and Wickner, 2008) and non-prion aggregates (Kryndushkin and Shewmaker, 2012) and binds well to Hsp42 (Malinovska and Alberti, 2012): are the AIDOPOD foci the same as the Btn2 aggregation foci? 2) In the subsection “AIDOPOD formation is required for asymmetric inheritance of protein aggregates and may promote aging”, the authors state that “Altogether, these data provide evidence that collection of protein aggregates into a single deposit (AIDOPOD) by Hsp42 promotes their asymmetric retention in the mother cell during cell division.” This is not established by the data presented, which examines only the presence of various chaperones in these foci: Hsp104, Hsp70s (Ssa1p, Ssa2p), and Hsp42. Are there protein aggregates in these foci? Or do the authors mean that these are foci of aggregated Hsp104, Hsp70 and Hsp42? I doubt that. It is not established that there are any protein aggregates in the AIDOPOD foci, and they might even be membrane-bound collections of soluble proteins. 3) Figure 3: In [PSI+] cells, Sup35-GFP forms multiple dots (shown by many groups, but first by Patino and Lindquist in 1996). In Figure 3B, there is just one big dot, and otherwise, the GFP seems to been even across the cell, just like the [psi-] cells in Figure 6A. And Sup35-GFP dots in [PSI+] cells are seen in over 50% of the cells, not just in older cells. Something is wrong here. 4) Subheading “Formation of a protein deposit during early replicative aging”: “…Hsp104, a broad sensor for protein aggregates (Figure 1A, (Jackrel et al, 2014)).” Jackrel et al do not show that a dot of Hsp104 means an aggregate of other proteins. 5) The Introduction is not very informative. How about Nyström's asymmetric protein segregation studies and aging? References are cited, but the results in the papers are not mentioned. How about Guarente's work on role of Sir2 and aging? In summary, the work here is largely well done, but it seems likely that the authors' new name applies to foci described by Bukau, Nyström, Alberti, Kryndushkin, Kaganovich and others. And it is not clear that they are dealing with aggregates. This manuscript from Saarikangas and Barral characterizes age-induced protein aggregates that are asymmetrically retained in mother cells during replicative aging in S. cerevisiae. Their findings join a fairly extensive literature about protein aggregates, but the authors propose that the aggregates they define are distinct from previously described protein deposits and furthermore, that they contribute to replicative lifespan. Protein aggregates have been observed and studied in cells for 50 years. But in the last nearly 20 years, there has been a steady appreciation that canonical heat-shock induced proteins are associated with aggregates (Lindquist lab and others). In yeast, Hsp104 was found to promote “disaggregation” of stress-induced protein aggregates, along with the aid of the Hsp70 family of chaperones and the Hsp26 and Hsp42 families of small heat-shock proteins. More recently it has become clear that not all aggregates are equal. For instance, stress induced “Q bodies” initially form as numerous small protein aggregates that eventually coalesce into one or two larger, terminal aggregates (Kaganovich et al., 2008; Escusa-Toret et al., 2013). Q-body formation is promoted by Hsp42 and antagonized by the disaggregase Hsp104. The best-characterized terminal protein aggregates are the juxtanuclear quality control (JUNQ) compartment and the vacuole-associated insoluble protein deposit (IPOD) compartment. JUNQ is composed of ubiquitinated misfolded proteins near proteasomes on the ER, whereas IPOD consists of vacuole-associated aggregates of terminally misfolded proteins that appear unable to be degraded. Protein aggregates were first appreciated in yeast replicative aging when carbonylated proteins (a marker of oxidative damage – Aguilaniu et al., 2003) were found to be retained in the mother cell. These damaged proteins reside within Hsp104 foci (aggregates – Erjavec et al., 2007) and their retention in the mother is dependent upon Sir2 and actin. More recently, the kinetics of Hsp104 foci formation after stress induction has been characterized (Zhou et al., 2014). The foci initiate during translation at the ER and ultimately form aggregates at the ER and mitochondria. The aggregates on mitochondria are retained in the mother in Fis1-dependent process. In the current manuscript, Saarikangas and Barral characterize an age-induced protein aggregate, which they call the AIDOPOD. It forms under normal, non-stressed conditions and is retained in mother cells. The experiments in this manuscript are technically sound and presented clearly. However, some of the data overlap substantially with previously published work, which is discussed below along with a list of the major findings. 1) AIDOPOD properties: forms naturally in old mother cells, usually within the first three generations; composed of heat-shock proteins Hsp104, Ssa1, Ssa2, Hsp42, and Ydj1, but not Hsp26, Sis1, or Hsp82; inherited asymmetrically to the mother. Most of the AIDOPOD properties (age-induced foci, asymmetric retention) have been previously described for Hsp104-GFP foci. The current manuscript adds the observation that these foci co-localize with several other heat-shock proteins, although most of these markers have been characterized previously in stress-induced aggregates in young cells. 2) The AIDOPOD fusion-after-mating assays are largely novel and may represent a generally useful tool for studying the effects of different chaperones on protein aggregate formation/disassembly. However, as noted above, previous work has demonstrated by other means that stress-induced foci coalesce into larger aggregates, which presumably aids in asymmetric retention (Escusa-Toret et al., 2013, Coelho et al., 2014). 3) AIDOPOD formation is Hsp42-dependent and antagonized by Hsp104. A paradigm in which Hsp42 promotes aggregate formation while Hsp104 dissolves aggregates is already well-established and extensively tested in stress-induced aggregates (Specht et al., 2011, Escusa-Toret et al., 2013). The current manuscript extends this paradigm to age-induced protein aggregates. 4) hsp42Δ cells lacking an AIDOPOD are long-lived, whereas hsp104Δ cells, which form an AIDOPOD at an earlier age, are short-lived. hsp104Δ double mutants have many protein aggregate foci that distribute more symmetrically between daughter and mother, and these cells are as short-lived as the hsp104Δ single mutant. The short lifespan of hsp104Δmutants has been reported, as well as the inability of Hsp104 overexpression to extend lifespan (not reported here, but reported in Erjavec et al., 2007; Andersson et al., 2013). The current authors appear to be the first to demonstrate and interpret the long lifespan of hsp42Δ mutants. The authors argue that Hsp104 is essential for a normal lifespan, whereas Hsp42, by aggregating misfolded or damaged proteins into the AIDOPOD in the mother, initiates mother/daughter aging asymmetry. Both aspects of this model have been proposed separately, but this work is the first to unify the models with regards to aging. A likely prediction from their model is that Hsp42 overexpression might shorten lifespan, as these cells accumulated an AIDOPOD at an earlier age than wild-type cells. The current manuscript would benefit substantially from this experiment. Taken together, the data presented here will provide a valuable resource for future studies on age-induced protein aggregates. However, much of the manuscript has merely extended existing models from protein aggregates that are stress-induced, particularly Q-bodies, to protein aggregates that are age-induced. Furthermore, previous studies on age-induced Hsp104 aggregates demonstrated that their asymmetric retention is actin and Sir2-dependent (Erjavec et al., 2007), and that their presence is intimately linked to proteasome function (Andersson et al., 2013). The current manuscript ignores this existing framework with respect to characterizing the AIDOPOD and provides minimal mechanistic insight. Therefore, although valuable, the current manuscript does not substantially advance the field or lead to new paradigms, and would be better suited to a journal that accepts more modest advances. Yeast cells have been proposed to model diverse aspects of aging related to aging in humans. But this argument has failed to capture the imagination of colleagues studying other organisms. This paper could make an important difference. Even more importantly, the asymmetric segregation of cell fate determinants is of great importance in biology and there are no systems to study this that are as tractable as yeast. This paper provides an elegant demonstration of the organism's potential for rigorous thoughtful dissection of these problems. For example, the distinction between the age-related deposits and general stress deposits is surprising and important. The same is to be said for the distinction with P-bodies. The results of mating were fascinating. As were the results of the Hsp42 deletion and the interplay between Hsp42 deletion/OE and the deletion/OE of Hsp104, and of mating to further dissect their roles relative to that of Hsp70. The paper is very well written (except see below) and the diversity and thoughtfulness of the experiments is very impressive. That said, there are several points that need to be addressed. The paper has the abbreviated feeling of having been contributed to another journal with extreme pressure for publication space. It should be re-written for eLife. For example, no information – or referencing – is provided about the biochemical function of Hsp42, which emerges as such a key player here. Nor is there any reference to phenotypes of Hsp42 mutants. In fact there are very few phenotypes reported, which makes the role of this protein in the aggregation foci particularly interesting.) There is virtually no referencing about Hsp104. Saibil's important work on Hsp104 and Ssa1 localization to specific unique foci in prion-containing cells isn't referenced. Nor are any of the foundational papers on Hsp104 function with Hsp70 in protein disaggregation. Too many uses of “remarkably”. Since so much of the work depends on the localization of fusion proteins, the ability of these proteins to rescue WT activity (that is, their functionality) should be referenced or established. It was very convincing that Hsp104 “aggregation foci” remain in the mother cells. But it was very difficult to see the aggregation foci that are newly arising after several cell divisions in daughters that are becoming aging mothers – Figure 1D, green arrowheads, and movies. This is such a crucial initial point, the evidence has to be convincing. The Materials and methods section here is very brief. Since these foci are difficult to see, was there an objective measure of the formation of these foci? For example, through quantitative high-content imaging? That is clearly implied by Figure 1E, but not established. I have no doubt that the authors are seeing what they claim, but it isn't demonstrated adequately in the figures for readers to appreciate. A very substantial fraction of yeast cells contain a prion known as [RNQ+]. This prion is known to require Hsp104, to interact with Hsp104 and Hsp40, and to localize to specific cellular sub-compartments. Moreover, it is the one prion that most profoundly influences the aggregation of other proteins. It must be determined whether the cells the authors are studying contain this prion or not. And for at least the beginning phenomena, it should be looked at in [RNQ+] and [rnq-] cells. Is it accurate to compare the foci to an “organelle”? Or to call it a “compartment”? I think their own experiments suggest they are in much more dynamic association with cytoplasmic aggregates than is suggested by that terminology. I am asking the authors to think about whether this phrasing is necessary. I believe that the authors have largely responded to my comments. The comparison of the current work's age-related aggregate site to other aggregate-collecting sites described by others is an important addition to this paper. Moreover, the statement at the end of the Introduction – “Our findings unveil a prevalent and highly coordinated early aging-associated aggregation response that opposes the view of aging and age-associated protein aggregation as a purely stochastic deterioration event” – I never thought it was thought to be “purely stochastic”. Rather, Nyström showed quite clearly that the retention of aggregates in the mother cell was very specific and directed. An opinion to the contrary from another group seems to have been refuted. And “unveils” is a little too strong. The authors have satisfactorily addressed the concerns I had with the earlier version of this manuscript. While there are similarities between the characterization of Hsp104 foci as described by Nyström and this work, the new characterization of the AIDOPOD and its differences between all the previously described stress induced foci (IPOD, JUNQ, Q-bodies) has never been explored before. Hence I feel it provides a bit of clarity to an otherwise confusing field – especially with respect to the aging field. Note that in the revised manuscript, the authors do a much better job of explaining differences between aging and external stress derived aggregates. Hence, I believe the manuscript is now suitable for publication in eLife. The paper is much improved. Its importance is nicely summarized in the last paragraph of the Introduction. I would also add that the pace with which protein foci are being reported in human diseases of aging, in yeast models of these proteinopathies, in the prion field, for diverse RNP granules, purinosomes, liquid-to-solid phase transitions of intrinsically disordered proteins, etc. has been accelerating at an amazing rate. Hence there is all the more need to have some distinctions and order brought to the field, for these distinct highly organized age-related deposits. Wading into the realm of this literature is formidable for the naive reader. So I would suggest that the author note and comment on two recent papers that came out since they submitted their work. Drummond's group has reported a fascinating formation of profuse, functional protein “aggregates” by particular groups of proteins in response to stress. It should be just mentioned that the current age-related deposits in this manuscript are distinct from those. (Also, see paragraph three, Introduction, the Drummond aggregates don't depend on translation). Brenda Andrew’s group has reported on the dynamic behavior of many GFP protein foci and overlaps or distinctions should be mentioned. Following the reviewers’ advice, we have been able to substantially improve our manuscript, and would therefore like to request for the possibility to resubmit our work to eLife to be reconsidered for publication. 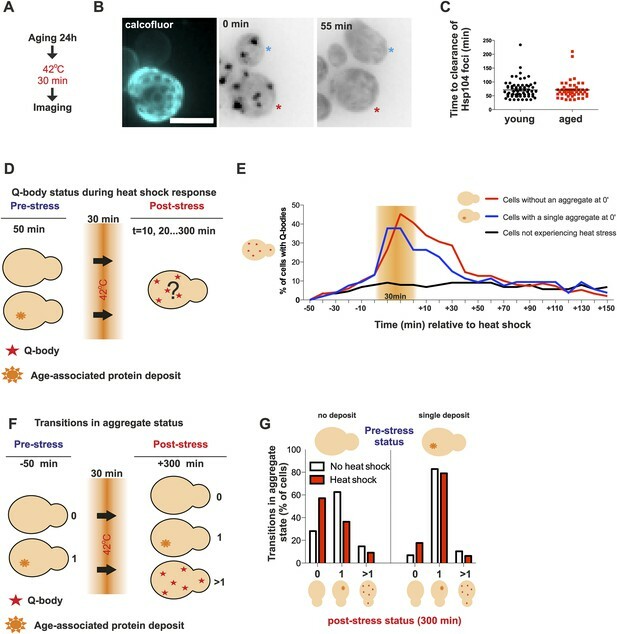 In the original submission, we described a physiological, early replicative aging-associated event in budding yeast: the formation of a singular and durable protein deposit harboring amyloid-like proteins, which is faithfully partitioned to the mother cell during cell division. We showed that the dynamics of this structure are dependent of the interplay between Hsp42-aggregase and Hsp104/Hsp70-disaggregase-activities. Furthermore, we demonstrated that the prevention of the deposit formation resulted in the inheritance of its constituents by the daughter cells, and prolonged the life span of the aging mother-cell-lineage, altogether providing evidence that protein aggregates are involved in the specification of the yeast-aging lineage. 1. Expanded our analysis on the role of the age-associated protein deposit in protein quality control. We employed transient proteotoxic stress assays to show that aged cells with a protein deposit efficiently clear proteotoxic stress, and that exposure to proteotoxic heat stress counteracts the formation of the age-associated protein deposit. This provides evidence that the deposit formation is not a consequence of defective protein quality control. 2. Examined the relationship between the age-associated protein deposit and the previously described quality control “foci” (Q-bodies, JUNQ, IPOD and INQ). By visualizing these foci in the context of the age-associated deposit, we now provide evidence that the age-associated protein deposit does not fulfil the typical characteristics of any of the previously characterized protein deposit sites. This validates the originality of our findings and demonstrates an important distinction between age-induced, stress induced and pathological protein aggregation modes. 3. Analyzed the degradation kinetics of nuclear and cytoplasmic proteasome substrates at the single cell level in vivo. This demonstrated that the presence of the age-associated protein deposit aids the degradation of cytosolic proteasome substrates, providing evidence that this deposit has a functional role in promoting protein quality control. A point-by point-discussion is included below. Altogether, our results shed light on the poorly described aspects of aging, protein quality control, asymmetric cell division and cellular fate determination. We hope these extensive revisions will allow the reconsideration of our manuscript, now entitled “Protein aggregates are associated with replicative aging without compromising protein quality control”, for publication in eLife. We expressed the classical JUNQ-marker VHL-GFP and found that the resulting VHL-foci typically did not (87% of cases, N=29) recruit the age-associated deposit marker Hsp104 within 30 minutes from their appearance. In our hands, the VHL expression often led to an overall increase in Hsp104 expression, which made the overall interpretation regarding the age-associated deposit difficult (Figure 3C-D). As an alternative approach, we used a strain carrying Hsp82-GFP, Hsp104-mCherry and a deletion of rpn4, which results in a decreased amount of proteasomes and consequently in an accumulation of proteasome-destined material (JUNQ cargo). Hsp82 does not localize to the age-associated protein deposit (Figure 1C), but localizes to Q-bodies (Figure 3B), which are considered to be the early representation of JUNQ-destined material (Escusa-Toret et al., 2013). Hsp104 marks Q-bodies (Figure 3B), JUNQ (Kaganovich et al., 2008) and the age-associated deposit (Figure 1A). While most of the cells displayed several Q-body like aggregates enriched both with Hsp82 and Hsp104, we were also able to identify cells that displayed two discrete deposits: a JUNQ-like focus (Hsp82 and Hsp104 positive), and an age-associated deposit-like puncta (Hsp82 negative, Hsp104 positive) (see an example in Figure 3E), suggesting that these two compartments can co-exist. The “JUNQ” was renamed as the “INQ” by a recent work showing that this compartment resides inside the nucleus and requires Btn2 for its formation (Miller et al., 2015). We conducted rigorous analysis on the coexistence of Btn2 and Hsp104-deposits during aging. By analyzing altogether 1268 cells we found 30 examples where cells displayed a Btn2 focus, but only one of them was enriched in HSp104 (Figure 1C, Figure 3F-G). Furthermore, the appearance of the Btn2 focus was not associated with replicative aging (average age of Btn2-focus containing cells was 1.2 generations). The study by Specht et al. (2011) identified the requirement of Hsp42 for the formation of “peripheral aggregates”, which are analogous to the Q-bodies (Escusa-Toret et al., 2013, Miller et al., 2015). Our data shows that the Q-bodies and age-associated deposits can be distinguished by their durability (Figure1 and Figure 3A), and by the difference in associated chaperones (Figure 1C and Figure 3B). Hence, although both structures require Hsp42 for their formation, they are likely not the same structures. The JUNQ formation results from prolonged proteotoxic stress (formation of Q-bodies) associated with defective degradation (Kaganovich et al., 2008, Escusa-Toret et al., 2013). We found that exposure to proteotoxic heat stress does not promote, but rather mildly inhibits the formations of age-associated protein deposits (Figure 4D-I), suggesting that presence of JUNQ destined material does not promote age-associated deposit formation. We also expanded this analysis to look at the IPOD structure (undynamic aggregate formed by Rnq1, Kaganovich et al., 2008). In contrast to what we observed with the JUNQ marker VHL, the Rnq1-aggregates were efficiently recognized by Hsp104 (>98% of Rnq1-foci accumulated Hsp104 within 30 min of their appearance, N=53). However, we did not observe accumulation of Rnq1 to a pre-existing age-associated protein deposit (see arrowhead in Figure 3H). Moreover, we analyzed 117 Hsp104 foci-containing [PIN+, PSI+]-cells and found that in 98.3% of the cases, Rnq1-GFP did not accumulate to this site (Figure 3J). The two examples of cells that had and Rnq1-focus, both displayed >1 Hsp104 foci, of which only one was Rnq1-positive (Figure 3J). Together with the results of the Rnq1-over-expression, this suggests that the Rnq1-aggregate is probably not equivalent to the “typical” age-associated deposit. It is likely that the Hsp104-labeled aggregates observed by Erjavec et al. (2007) in aged cells refer to the same structure as those described in our work. There are some differences regarding the appearance (the number of foci per cell appears higher in their work) and segregation (we did not observe a segregation defect of age-associated aggregates in hsp104 mutant cells). These disparities could be due to different experimental approaches used by these studies. Although we acknowledged their seminal papers in the original submission, we have now paid attention to discuss them in more detail in the Introduction and refer to them where appropriate. Collectively, these results provide evidence that the age-associated deposit is not identical with Q-bodies, JUNQ/INQ, Btn2-foci, or IPOD, but rather that it can co-exist with these deposit sites. These results are now shown in Figure 1C, Figure 3, Figure 4 and discussed in the Results and Discussion. We show that the age-associated deposit collects endogenous protein aggregates formed by Sup35 in its prion [PSI+] form, and that this Sup35-enriched deposit is asymmetrically retained by the mother cells during cell division (Figure 2A-G). Since the non-prion [psi-] form of Sup35-GFP did not accumulate to the age-associated deposit, we assume that the deposit recruits amyloid-like substrates. These results are now described in the revised manuscript in Figure 2 and we have further clarified this issue in the text. We have now clarified this issue by improving the quality of the original pictures to allow a more accurate interpretation of the phenotype of the [PSI+] cells. As pointed out by the reviewer, Sup35 often forms multiple aggregates in [PSI+] cells (Figure 2 B, white arrowhead indicates Sup35 in the age-associated protein deposit, red arrowhead indicates Sup35 aggregate seeds that are not associated with Hsp104). Most of the studies that have visualized Sup35-dots (including the study by Patino et al.) made use of over-expression constructs, which often encode solely the prion domain of Sup35 (Sup35-NM). This is, for many reasons, not comparable to visualization of the endogenous protein, as was done in our study. Our findings are in agreement with studies conducted with endogenously tagged Sup35 in [PSI+], showing that the aggregate distribution depends on the strength of the [PSI]-phenotype (“strong” [PSI+] has more small aggregates and “weak” [PSI+] fewer but larger aggregates) and, importantly, that replicative aging result in shifting towards larger Sup35 aggregates (see e.g. Derdowski et al., 2011). We have now changed the reference for this statement to a recent review (Haslberger et al.,2010.). This review summarizes the role and numerous substrates of Hsp104-mediated protein disaggregation. As discussed above, we have now re-written and substantially expanded the Introduction to make sure we discuss and reference the results of all the publications that are relevant to our work. Most of the AIDOPOD properties (age-induced foci, asymmetric retention have been previously described for Hsp104-GFP foci. The current manuscript adds the observation that these foci co-localize with several other heat-shock proteins, although most of these markers have been characterized previously in stress-induced aggregates in young cells. 1. What is the relationship between the age-associated protein aggregation and the formation of Q-bodies, IPOD and JUNQ/INQ? 2. What is the role of the age-associated protein deposit in the functionality of protein quality control? The age-associated deposit is not analogous the Q-bodies, JUNQ/INQ or IPOD (Figure 3, see response to reviewer #1). Cells with an age-associated deposit respond and dissolve proteotoxic stress as fast as their clonal counterparts without an aggregate, providing the evidence that their formation is not due to inability of cells to clear protein aggregates (Figure 4D-E). Proteotoxic stress (Q-bodies) does not enhance, but rather counteracts the formation of the age-associated deposit (Figure 4H-I). Cells with an age-associated protein deposit display accelerated degradation rate of cytosolic proteasome substrate, demonstrating a direct functional role for the age-associated protein aggregation (Figure 5). Together, these added data provide evidence that age-associated protein aggregation has initially a positive influence on protein quality control and resolves its relation to the previously described deposit sites. Please see our reply below. Indeed, our data supports the proposed aggregase-disaggregase-scheme, which seems generally apply to stress-induced aggregation in both budding and fission yeasts (Specht et al., 2011, Escusa-Toret et al., 2013, Coelho et al., 2014). Our work brings upon one important distinction to this model: unlike with stress associated aggregates, in the context of aging, Hsp104 is unable to dissolve the age-associated structures (Figure 1) – unless cells experience stress response, which can lead to transient disassembly of the age-associated deposit (Figure 4). We have discussed this in the model presented in Figure 8D, as well as in the Results and Discussion. 4) hsp42Δ cells lacking an AIDOPOD are long-lived, whereas cells, which form an AIDOPOD at an earlier age, are short-lived. hsp104Δ double mutants have many protein aggregate foci that distribute more symmetrically between daughter and mother, and these cells are as short-lived as the hsp104Δ single mutant. The short lifespan of hsp104Δ mutants has been reported, as well as the inability of Hsp104 overexpression to extend lifespan (not reported here, but reported in Erjavec et al., 2007; Andersson et al., 2013). The current authors appear to be the first to demonstrate and interpret the long lifespan of hsp42Δ mutants. The authors argue that Hsp104 is essential for a normal lifespan, whereas Hsp42, by aggregating misfolded or damaged proteins into the AIDOPOD in the mother, initiates mother/daughter aging asymmetry. Both aspects of this model have been proposed separately, but this work is the first to unify the models with regards to aging. A likely prediction from their model is that Hsp42 overexpression might shorten lifespan, as these cells accumulated an AIDOPOD at an earlier age than wild-type cells. The current manuscript would benefit substantially from this experiment. As the reviewer suggested, we have now measured the life span of Hsp42 over-expressing cells. This pedigree analysis showed that Hsp42 over-expression did not have any effect on median life span compared to wild type cells (22 vs. 22 divisions, N=141 each, see below). This suggests that the effect of Hsp42 on aging is already fully attained with the wild type protein levels, which is not surprising since most cells in both groups (WT and Hsp42-OE) formed the deposit already during the first quarter of their life span (Figure 6E). In this regard, it is important to note that we still do not exactly understand how does the deposit influence life span. We have now discussed this result in the subsection “Age-associated protein deposit formation is required for asymmetric inheritance of protein aggregates and may promote aging”. We have now extensively discussed the existing framework in the Introduction, Results and Discussion. We also provide experimental proof that clarifies the important contextual/functional differences between age-associated protein aggregation and stress/pathological protein aggregation models. Furthermore, we provide evidence supporting a functional role for age-associated protein aggregation in cellular quality control. Actually, this work has never been submitted elsewhere. We want to apologize for the tight formatting of our original submission, which was an oversight on our part due to an initial intent to submit this work as an eLife “short report”. However, prior to submission we realized that we would not be able to fulfill the length requirements of this format. We have now re-written the paper in the article format and made sure we discuss and reference the most important papers related to our work, including those kindly pointed out by the reviewer. We have paid attention to reduce this wording. The main reference proteins used in this study are Hsp104 and Ssa1 tagged C-terminally with a fluorophore (GFP or mCherry). The Hsp104-C-terminal fluorophore chimera has previously been shown to be fully functional in disaggregation (thermotolerance) (see e.g. Specht et al., 2011, Coelho et al., 2013). We have now referenced to this in the Figure 1 legend. Regarding the functionality of Ssa1-GFP, we have crossed it to ydj1Δ, which did not lead to lethality, although according to the SGD (http://www.yeastgenome.org/), the ssa1 mutant is synthetic lethal with ydj1Δ. This argues that Ssa1-GFP is functional, at least in the conditions used in our study. The aggregation foci were scored by eye from maximum intensity projected images (spanning the entire volume of the cell), and were defined as puncta that display high-intensity over the surrounding cytoplasmic background signal. The quantification of aggregate intensities were carried out from SUM projected videos, and the intensity values were normalized to the surrounding cytoplasmic value. The formation of the age-associated deposit was followed in time-lapse movies, where their dynamic maturation process could be followed frame-by-frame (Figure 1D-E). We have now improved the quality of the images in Figure 1D and have expanded the Materials and methods to describe in more detail how the aggregates were detected. We have now looked at the influence of the [rnq1-] vs. [RNQ+]-state on the formation of the age-associated protein deposit. To distinguish if the Mother Enrichment Program (MEP) strain mainly used in this study is in the [rnq-] or in the [RNQ+]-state, we expressed the Sup35-NM-domain in these cells. The Sup35-NM expression results in the formation of aggregates only if the cell is in the [RNQ+]-state (see e.g. Liebman et al., 2006, Methods). The MEP-strain readily formed aggregates upon induction of Sup35-NM-YFP-expression (see below) and hence is in the [RNQ+]-state. We have now mentioned this in the text (subheading “The physiological constituents of the age-associated protein deposit include prion protein Sup35”). The expression of Sup35-NM-YFP in the MEP strain. Left: at the start of the GAL induction, Right: 250 minutes later. We also assessed the influence of the [rnq-] state on the age-associated protein aggregate formation, by comparing the Hsp104-deposit formation between rnq1Δ [rnq- psi-] and WT [RNQ+ PSI+] cells. We found that the rnq1Δ cells displayed an enhanced formation of age-associated Hsp104-foci as compared to the [RNQ+]-cells (N=118-874 cells per group, see below). Finally, we also looked at the localization of Rnq1-GFP to the age-associated deposit and found that it typically does not localize there, although when it aggregates, it is recognized by Hsp104 (please see the detailed discussion above in the answer to Referee #1). We find it very interesting and somewhat unexpected that the deletion of rnq1 [psi-] has a positive effect on aggregate appearance. However, since we do not yet fully understand why this is and how it relates to our existing framework, we have decided to not include these data into the current manuscript, but mentioned this result in subheading “The physiological constituents of the age-associated protein deposit include prion protein Sup35”. The cells that accumulate Sup35 into the age-associated foci are in the prion [PSI+] form. In the prion negative [psi-] cells, Sup35 did not accumulate to the age-associated deposit, suggesting that prion (amyloid)-like fold directs it to be stored at the age-associated protein deposit. This also fits with many characteristics of this deposit, including its durability and the slow exchange rate. Interestingly, the deletion of Hsp42 promotes [PSI+] prion induction and its over expression promotes curing (Duennwald et al., 2012), which is in accordance with the concept that it functions as the depositor. We have now expanded the discussion about the possible outcome of Sup35 storage to the age-associated deposit (paragraph three, Discussion). Following the advice of the reviewer, we have revised the text and no longer talk about the structure as “organelle-like”, but rather as a compartment. “Interestingly, we found many cells displaying an aggregate (typically a single bright Hsp104-labelled focus) and this portion increased in a progressive, age-dependent manner such that >80% of cells that had undergone more than 6 divisions displayed such a structure (Figure 1 A-B), as previously reported (Aguilaniu et al., 2003 and Erjavec et al., 2007)”. We have now modified the end of the Introduction according to the reviewer’s suggestion. We have now cited this interesting paper by the Drummond group in (in the Introduction and subheading “The age-associated deposit is distinguishable from the previously described protein quality control deposits”), where we compare the heat-induced and age-associated aggregates. Furthermore, we decided to remove the sentence in the Introduction about the requirement of translation to the heat induced aggregates. Brenda Andrews group has reported on the dynamic behavior of many GFP protein foci and overlaps or distinctions should be mentioned. We are not certain to which paper the reviewer is referring to, but we suspect it to be the recent paper by the Andrews group concerning the proteome wide localization analysis (Chong et al. 2015). This database and its source files will surely be a valuable resource to search for proteins that might be directed to the age-associated protein deposit. However, their automated identification pipeline of protein localization did not include cellular puncta, as stated in this paper: “small punctate compartments are difficult to distinguish computationally”. We have now cited this paper in the Discussion, where we discuss the importance to compare the localization of the age-associated aggregate with organelles and their components. This study was financially supported by the ETH Zürich, FEBS Long-Term Postdoctoral Fellowship and a Finnish Cultural Foundation (Post Doc Pool) Fellowship (to JS) and through an advanced grant of the European Research Council to YB. We would like to thank Simon Alberti, Judith Frydman, Dan Gottschling, Björn Hegemann, and Matthias Peter for reagents, ScopeM, especially Tobias Schwarz for microscopic support, Marek Krzyzanowski, Sung-Sik Lee, and Bernhard Sebastian for kindly sharing their microfluidic expertize and Fabrice Caudron, Annina Denoth-Lippuner, and Ana-Maria Farcas for helpful comments on the manuscript.